All of the Wheels are Laced... and a Big "?" Yesterday, when I got home from work, I was absolutely shattered and didn’t want to do much of anything other than lay down on the sofa and fall asleep, but as I lay there, struggling to keep my eyes open, I glanced over at the mountain wheelchair parts and decided to crack on! I’m really glad I did as I managed to get all six wheels laced. Ta-da! 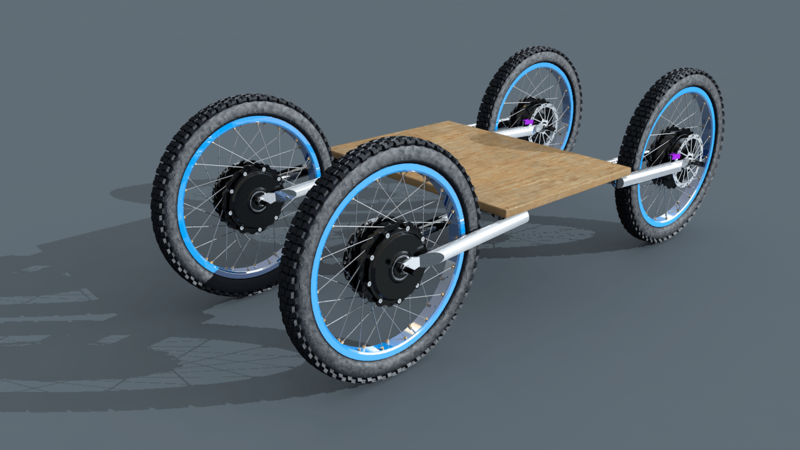 Six wheels for the mountain wheelchair! It’s taken quite a lot of modification for the wheel rims to accommodate the spokes. I think they might be motorbike or scooter spokes? By the time I’d finished the fifth and six wheels, I realised I’d done a much better job of these than I had the first and second wheel. With this in mind, I will definitely need to do two wheels again and perhaps even four. Still, I’m really happy with the result and the spokes look like they’re up to the task of transferring the motor torque to the wheels. As I was tidying up the mess I’d made in my “living room” whilst lacing the wheels, I decided to throw out the boxes that the motors had arrived in. The sense of elation I got just from throwing out some boxes is, in a sense, quite funny. For me though it signified a step forward. No longer are the motors being kept in storage; I’ve actually started building this thing! The really cool, yet at the same time worrying thing about having all of the wheels made is that in the process, I realised how quick and easy it would be to make a four-wheel-drive platform for testing purposes. Nothing complicated as I don’t want to waste too much time on it, just a plank of wood laid across four wheels would be sufficient. This would at least allow me to see if four of these motors are capable of carrying a heavy bloke like me up a hill. If not, then it will put a huge question mark over the entire Mountain Wheelchair project!